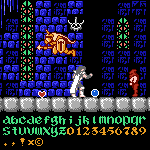 Recreation of the pixel font used in Irem's "Holy Diver" (1989) on the NES. This font breaks out of the traditional 8x8 grid, with some characters featuring an additional 1-2 pixel descender (stored in a separate tile in the ROM). With the exception of the "j" and "q" (which were completely absent), only the characters present in the game's tile set have been included. Info: Created on 1st November 2013 . Last edited on 2nd November 2013. @redux - That's a great example of a faux-Old English pixel font. Never knew such things were on the NES! There seems to be a spacing problem with the 'i'. @p2pnut the font is monospaced, and it's an exact replica of what's in the game's ROM/tile set. spacing is as it should be based on the game. @redux - Actually, p2pnut picked up on something I didn't mention; perhaps a clone version where the spacing is proportional? @Goatmeal do you mean i should make a proportional clone, or that there is a clone of the Holy Diver game out there with proportional spacing? i just double-checked the game itself, and it definitely uses monospaced "i" with the same spacing as my recreation. @redux - Sorry for the confusion! I meant that _you_ should make a clone that is proportional in spacing. I was going to suggest that in my first comment, but did not. Surely game designers of these old times had hard technical restrictions to deal with, and made sometimes inelegant compromises, but thousands of players played hours and hours within these aproximative environments. These flaws brought almost as the goodies their part in the special esthetic developped then. I remember a time where we only had 7 chars to name a file, i remember me as a kid playing for hours before a black and white tv pretending a rectangle to be my tennis racket and a square to be my ball... P O N G!